please find the product information and corporate news in the September issue of our Bulletin. Rack mount drawer is designed for storing of reserve of optical cables/patchcords. The design of the drawer enables to install it into a 19" rack. High 2U. 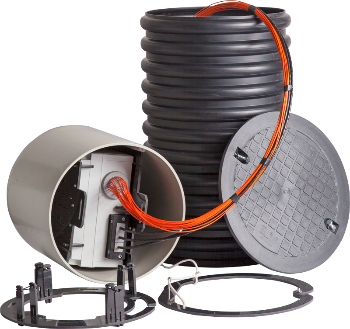 The MUC 315B underground chamber offers a comprehensive fibre junction solution in the distribution points in FTTx networks. The box is placed in diving bell in the chamber to prevent the access of underground water into the box. The chamber is designed for micro duct systems up to ∅ 12 mm. 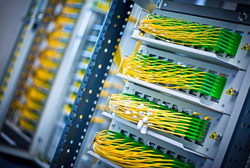 The chamber is intended to be used as distribution point in FTTx networks. The unique bell-based solution makes it ideal for frequent opening and easy modifications of the optical distribution box without compromising the ingress protection IP 68. The chamber is designed for installation in trench in a sandy ground. The chamber is always supplied with F-BOX 96S or F-BOX 48S 18SC. 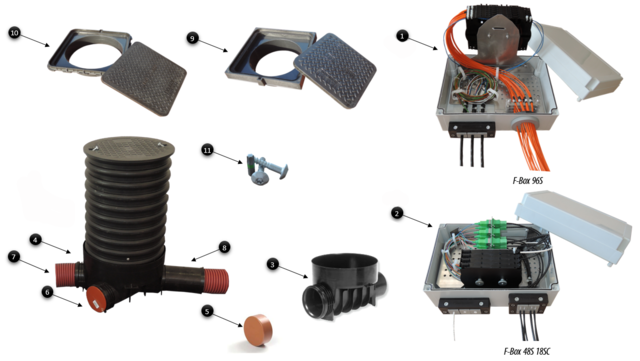 Bushing system for the distribution box inside the chamber must be ordered separately depending on the required cable diameters. 5. Optical distribution box F-BOX 96S or F-BOX 48S 18SC. 7. 4x micro duct holder. For us on paved surfaces, pedestrian zones and parking lots. For paved surfaces, angular lids are-used, where as ribbed lids are used in asphalt surfaces. Chamber can be extended at the bottom with two or four inputs. Unused inputs can be plugged. Further holes can be bored during the installation necessary. F-BOX 96S optical distribution box is designed for installation into the underground chambers MUC 315 and MUC 425. The distribution box is fastened inside the chamber bell and is used to splice optical fibers. Frame gland system is supplied separately upon required cable diameter. Distribution box is secured inside the chamber bell where is fixed by pressing into the prepared holder. When purchasing the frame gland system with inserts you are able to fit in up to 3 feeder cables with different diameters (see table product codes). Gland inserts are available in the range of 2-8 mm in 1 mm increments. Inserts are not part of the cabinet and are offered separately (see table product codes). Round grommet is used for drop cables and must be chosen according to the cable dimensions. Options are 76x 1.5 to 2.6 mm cable and 2x 2,5-5 mm cable gland or 19x 3.2 to 6.5 mm. Grommet is not part of the cabinet and is also offered separately (see table product codes). Part of accessories are cable holders, tightening belts, desiccant bag, plastic ranging eyes and sealing gel. The box is pre-installed with 6 pieces of splice trays KM1 for a total capacity of 96 splices. F-BOX 48S 18SC optical distribution box is designed for installatiojn into the underground chambers MUC 315 and MUC 425. 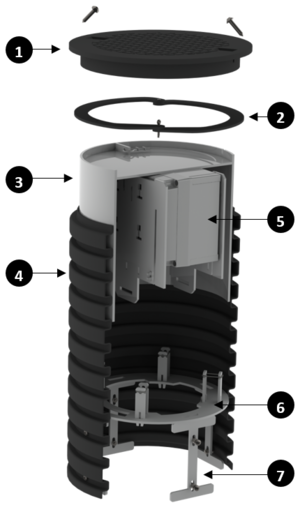 The distribution box is fastened inside the chamber bell and is used for patch cords interconnection or pre-connectorized cables. Frame gland system is supplied separatelly upon required cable dimensions. Distribution box is secured inside the chamber bell where is fixed by pressing into the prepared holder. When purchasing the frame gland system with inserts you are able to fit in up to 3 feeder cables with different diameters (see table product codes). Gland inserts are available in the range of 2-8 mm in 1 mm increments. Frame gland system is used for incoming and outgoing drop cables. Each insert includes 4x inputs in the range of 2-6 mm in 1 mm increments. All glands and inserts are not part of the cabinet and are offered separately (see table product codes). Part of accessories are cable holders, tightening belts, desiccant bag, plastic ranging eyes and sealing gel. The box is pre-installed with 4 pieces of splice trays KM2 for a total capacity of 48 splices. Adapter plate has 18x SC simplex footprints. We would like to inform you about the establishment of a new group of videos on our You Tube channel, where we will present our products in practical demonstrations of installation. from 16. to 20. October 2016 MICOS, Telcom division will participate in the GITEX 2016 international fair in Dubai. On this occasion we would like to invite you to our stand, where you will have the opportunity get to know our products and new features in greater detail and con-sult your projects with our experts.